Who (or What) Haunts SF's Spookiest Places? 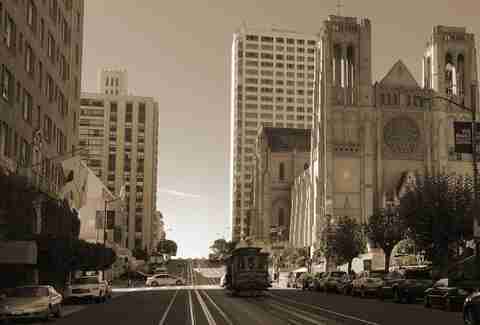 For being such a young city, San Francisco has a long and spooky history of money, madams, and murder. Not only are the city’s Victorian closets full of skeletons, but some of the city’s most famous houses are full of spooks and spirits that haunt us to this day. 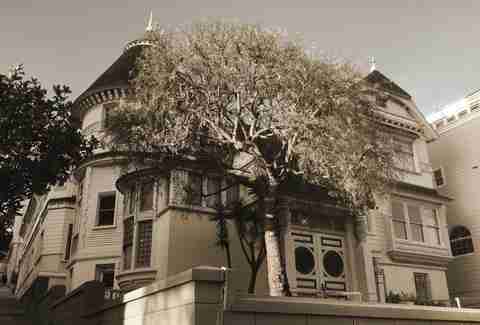 Take a stroll through the fog to find SF’s most hallowed haunts. It’s said that Mary Ellen Pleasant, the mother of civil rights in California and a general badass, haunts the tall eucalyptus tree she planted at 1661 Octavia St (the site of her former property). Known as Mistress Pleasant, she was born into slavery in Augusta, Georgia in 1814 and later studied under Marie Laveau, famous “Voodoo Queen” of New Orleans. She was very good at acquiring information about the powerful, corrupt, and elite in NOLA, and she used that information to do good. Pleasant brought those same tactics to San Francisco, where she freed slaves through the Underground Railroad between 1850 to 1865, ran multiple businesses, owned a large swath of property on Octavia between Bush and Sutter Streets, and was worth a cool $30 million. Rich, lazy, and unambitious George Atherton (the town of Atherton was named after his father) was a bit of an embarrassment to his socialite family, which built the mansion at 1990 California St in 1881. To prove to his mother and strong-willed wife Gertrude Franklin (grand-niece of Benjamin Franklin) that he could make a man out of himself, Atherton set out to sea with his naval officer cousin. Atherton barely made it three days before he got sick and died of kidney complications. He was returned home a few weeks later stuffed, but preserved, in a barrel of rum. Gertrude Atherton, now a free and single woman, would become one of San Francisco’s most important feminists, novelists, and historians. She feared her late husband would haunt her and moved out of the mansion quickly. 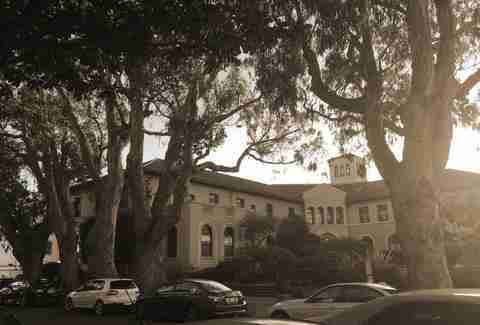 The Atherton mansion was eventually sold and divided into apartments, but to this day, tenants say they feel the presence of a few spirits creating mischief in their apartments -- things moving, wind rushing through closed rooms, and perhaps George knocking from inside people’s walls. Flora Sommerton, a member of one of Nob Hill’s wealthy families, was just 18 when her parents forced her into a marriage with a significantly older man whom she did not love. When her father made the official announcement at an engagement party in 1876, a combination of fear, anger, and guts ignited a fire in Flora and she walked out the door -- dressed in a white ball gown. She never returned home and was not found until she died in a cheap hotel in Butte, Montana, in 1926. It’s said that, on foggy nights, you can see young Flora walking down the middle of California St wearing the same old wedding dress they found her in when she died. 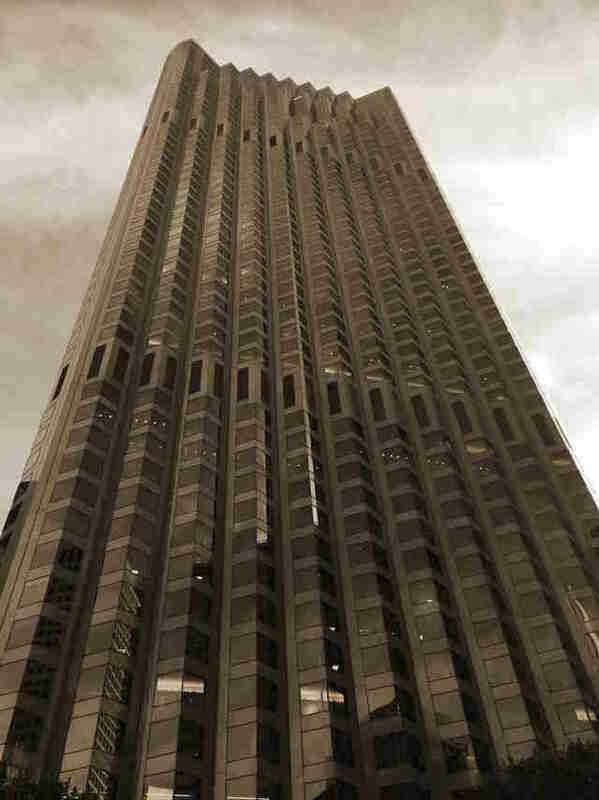 Built in 1969 as the world headquarters of Bank of America, this Financial District building was the tallest building in San Francisco at the time. Shortly after its opening, reports of poltergeist activity happened throughout the building: cold spots moving from room to room, and files flying off shelves. An employee working late one night reported seeing his own phone move itself off the hook. The source of the hauntings is unknown, although some have theorized it’s the spirits of victims from the 1906 earthquake still trapped in the ground underneath the building. Others claim it’s the collective energy of so many men and women, controlling the world’s money and desperate for more. Bank of America moved to North Carolina after its 1998 merger with Nations Bank, and things have been relatively quiet at 555 California ever since. Although, what’s really scary is that it’s currently managed by Vornado Realty Trust with 30% owned by Donald Trump. Sen. David C. Broderick (after whom the street was named) was an ambitious political climber who would eventually have a powerful hold on the city of San Francisco. Broderick was also an outspoken abolitionist in the Democratic Party while his buddy, California Chief Justice David S. Terry (who was known for getting into fights and shanking people), was a staunch supporter of slavery and advocated for its extension into California. This lost Terry re-election and he angrily blamed Broderick for it. Their public battle led to private letters which led to a secret duel on the edge of Lake Merced. Broderick’s pistol had a hair trigger and went off too soon; Terry took easy aim at Broderick and fired, hitting his lung. 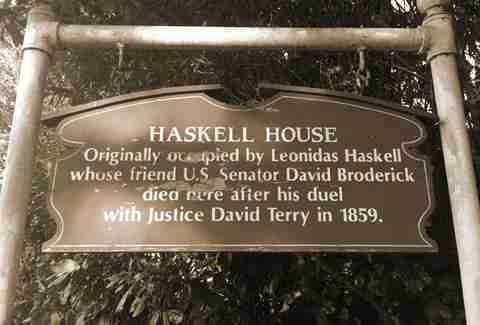 Broderick was taken back to the home of his friend Leonidas Haskell, where he languished in pain for three days until he died. This event became known is the “Last Duel in California” and Broderick would become a martyr for the anti-slavery movement. After the Union army took over the surrounding area in 1863, many captains lived in the Haskell House. The families of these captains have claimed to see bodiless shadows move across rooms, lights flashing, and plants tipping over. One colonel even felt the presence of someone watching him whenever he took a shower. And, don’t make jokes about Broderick, otherwise your portrait might be ripped off the wall, nail and all. However, this transition didn’t always go smoothly. While doing renovations in 1993, workers found 700 bodies buried underneath the Palace of the Legion of Honor, some still holding their rosaries. The whole area was once the Golden Gate Cemetery, a graveyard for poor and working class European and Chinese immigrants. The 700 that were found were moved to Skylawn Memorial Park in San Mateo County. But, experts say, there’s probably thousands more still under the museum. 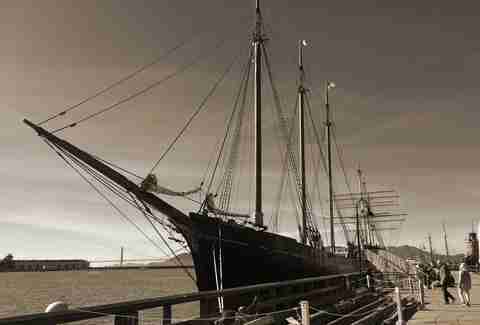 The captain of Norwegian sailing ship the Squando, which sailed through the Golden Gate in 1890, discovered that his wife was having an affair with the first mate. He was willing to forgive her in exchange for retribution. So, the captain’s wife got the first mate drunk one night and as she held his hands behind his back, the captain burst through the door with an axe and cut the first mate’s head off. The body was floating in the bay the next day. The captain, his wife, and the head, were nowhere to be found. Mysteriously, the next three captains were murdered by the crew. The Squando was taken back to New Brunswick where it was docked but no guards would stay on it as they all claimed to see a bloody headless man roam the ship at night. The ship was eventually demolished for salvage. On moonless nights, when the fog hovers in really low over the bay, you might see an old three-masted ship in the water sailing from point, to point, to point -- almost as if it’s lost its heading. 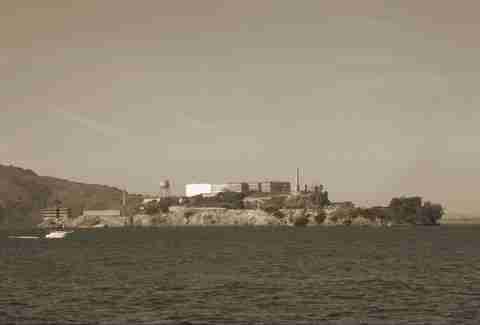 No list of strange and spooky places of San Francisco would be complete without a visit to Alcatraz. It’s believed that the Miwok Indians may have used the isolated island for thousands of years as a place to gather bird’s eggs for food (alcatraz means pelican in old Spanish) and to banish members of their society. 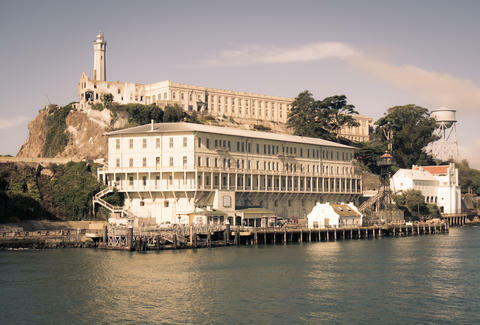 By 1859, the US government seized control of the island and used it to imprison 19 Hopi Indians who refused to give into aggressive government tactics to “Americanize.” In 1912 the US Army built a new prison on the island, and by 1934 the Fed took over and turned it into Alcatraz Federal Penitentiary, a prison designed to crush the souls of men. Both prisoners and guards suffered deep physical and psychological trauma while there. Rufe McCain spent three years in a metal box in solitary confinement in cell 14D, also known as the Hole. When finally released, McCain stabbed another inmate to death. He was acquitted because of the irreparable psychological damage his imprisonment had done to him. The prison closed in 1963 and shortly after reopened as a US National Park. Every since, night guards have claimed to hear the sounds of items breaking, people running, and men screaming. If you’re given the opportunity to sit in 14D during a visit, in one corner of the cell you may be overcome with emotion as you feel an icy chill wash over your body, even in the summer months. Be careful but be gentle, it may be Rufe begging to be set free. Christian Cagigal is an international performing storyteller, magician, and the new owner of the San Francisco Ghost Hunt Walking Tour, established in 1997. 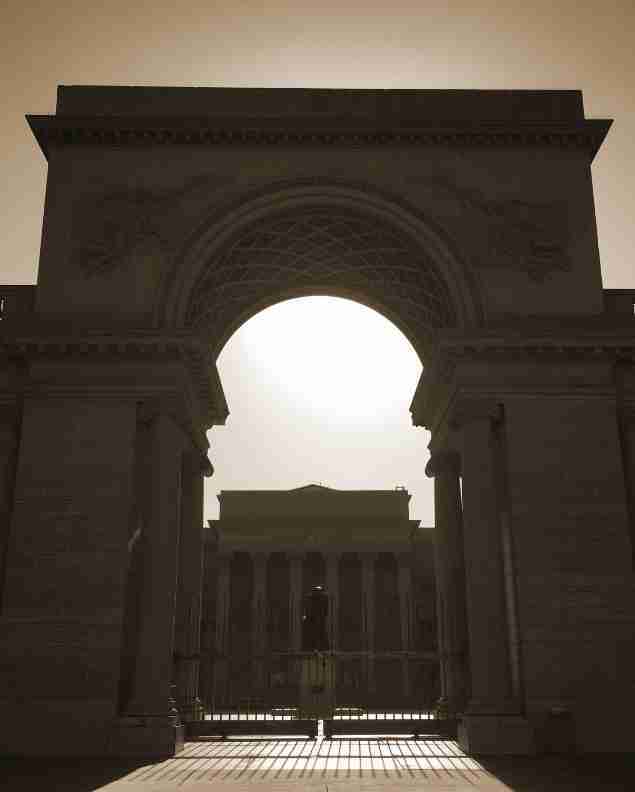 To learn more about SF ghosts and history go to www.sfghosthunt.com and join the hunt.